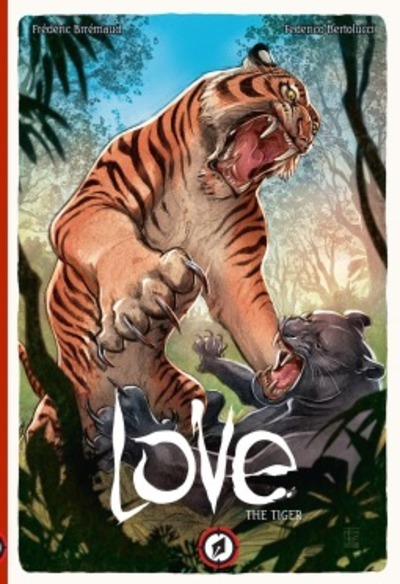 Love Volume One presents a day in the life of a tiger, as he hunts, fights and looks for shelter. The story is presented entirely without dialogue or narration, not even the sound effects written as words thing you often see in comic books ("Zap!" "Pow!" "Bamf!"). It's like a nature documentary in comic book form, minus David Attenborough. The lack of words would make this book suitable for younger readers who could still enjoy the story. They would find it educational since the animals are depicted realistically but more sensitive children might also find some scenes distressing. The beauty of the art means it will also appeal to older readers. It's definitely worth looking through ("reading" doesn't seem the right word) more than once and lingering on some of the beautiful pictures.